A truism in business remains that social trends, regardless of short- or long-term miseries created, will always be cradles of opportunities. Graying societies in Japan, Taiwan, China and elsewhere due to decreasing birth rates may alarm policymakers and life insurers, but are actually creating potentially lucrative opportunities for makers of children furniture. One reason is simply doting children in many Asian nations, where per-family number of offspring continues to drop. Reports are that many policy-enforced single-kid-per-family in China are coddled by not just parents but also grandparents, breeding unprecedented spoilt-rotten children, whose cost of upbringing inevitably command ever higher premiums. Such socially-questionable trend ironically spells good news for furniture makers in Taiwan, especially ones turning out products for children, whose fewer numbers mean parents can afford to and willingly pay more for furniture. And the children furniture market today has come a long way since a few decades ago, with form and function both improved significantly. Wrought Enterprise, set up in 1997 and originally focused on making office chairs, is one maker who has been drawn to the niche, having decided to diversify into children's chairs in recent years. Tapping its extensive design and production know-how, Wrought Enterprise entered the children furniture segment with high-end chairs, which seem to be scaled-down versions of its line of office chairs. The marketing strategy may be entirely different for children furniture because the products are generally more colorful and cuter than adult counterparts, says general manager Victor Wu, implying that the marketing mindset needs recalibrating. Wrought's line of children chairs may be smaller but are just as sophisticated as its upscale office chairs and make typical counterparts seem rudimentary, with coasters, airlift devices to easily adjust seat height, and 4-to-6 position adjustable seatback. A new marketing strategy has been hatched to promote children chairs. Besides labeling the line eponymously, Wrought will launch sets composed of children chair and desk, which will be designed to match. "It's a way to raise product value," says Wu, whose experience tells him that a package generates higher value than individuals. But the company also offers single items. The chief designer, Wu believes the key to designing children furniture is to elicit joy among children. "Color is very important for it helps to stimulate children's visual sense to inspire imagination, while bright colors attract attention and seed creativity," says Wu. The maker started making children chairs as an ODM (original design manufacturer) for several leading children furniture brands in Taiwan, and plans to explore the market in China via partnerships with local makers, as well as launch the Wrought-branded children furniture. Wu's brimming confidence in the children furniture market in China is buoyed by the official one-child policy, which practically turns kids into cash-generating bargaining chips for his business. King Yueh Cheng, a seasoned maker of wooden furniture, is a pioneer of children furniture in Taiwan, where it has consistently supplied "high-end" children furniture for 30 years to build a reputation as a specialist. Estsblished in October 1984 with a mission to "create health-enhancing and joyful learning environment for children," King Yueh Cheng was founded by the design manager Tommy Wei's father to mainly turn out children furniture because the man believed the decades-old classroom furniture cried out for improvement. Like most pioneers with grand vision, King Yueh Cheng fought an uphill battle in its early years when most families were too poor to afford "higher-end furniture" for children. Undaunted, the maker persisted to turn out "high quality" furniture for children, firmly believing that children is the most valuable national asset and so deserve quality furniture. Wei's father regularly discussed with educators about how to realize his goal, which was finally achieved by endless effort and steady improvements. Reflecting success in the niche, the maker's children furniture has won since 2000 the annual "Award for Excellent Children Education" from the Chinese Early Childhood Education Promotion Association. Now King Yueh Cheng is also an interior designer, handling customized furniture design and production projects for kindergartens, childcare centers and elementary schools. Originally focusing business in Taiwan, King Yueh Cheng now exports children furniture to Japan, the U.S., Hong Kong, and China. The success achieved in children furniture has motivated King Yueh Cheng to diversify into products for living rooms, kitchens, dining rooms and more, but remaining true to using wood. "It's a family tradition to use natural materials for furniture production," says Wei. King Yueh Cheng also uses only lead-free woods, as well as emphasizing safety in children furniture by eliminating sharp angles and maximizing structural integrity. 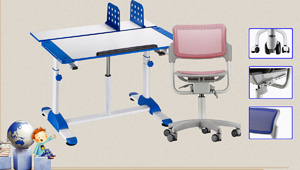 Kuang Shin Enterprise Co. is another major children furniture maker in Taiwan. Established in 1987, this maker began turning out metal office furniture parts and gradually diversified into children desks and chairs, computer desks, furniture hardware, OA chairs, display racks/storage racks and so on. It's been literally child's play for the seasoned maker to handle children furniture. Realizing a totally new marketing philosophy is needed to promote children furniture, Kuang Shin set up a special R&D group to design such products. 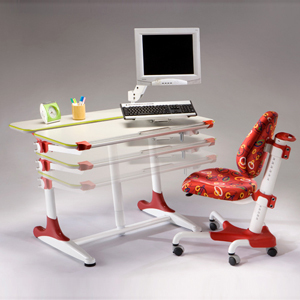 The goal is to design ergonomic desks and chairs, whose heights must be adjustable to allow children to literally grow with the furniture. One can say that buying only one chair from Kuang Shin suffices for a child can use it from elementary school through university. The children chairs feature key advantages of all upscale counterparts. The table is multifunctional as a computer desk that accommodates a PC and peripherals; while the chairs have gas-lift mechanisms for easy height adjustment; the waterproof upholstery enable easy-maintenance and UV wheels ensure smooth movement and scuff-free floors. The chairs are also multi-patented for design and structure. http://cens.com/cens/news/2011/NPIC_14111.jpg WROUGHT's motto is to design furniture to elicit joy among children. http://cens.com/cens/news/2011/NPIC_14112.jpg King Yueh Cheng also offers customized design and production of children furniture. http://cens.com/cens/news/2011/NPIC_14113.jpg Each of Kuang Shin's children furniture is ergonomic.